You won’t catch me spreading Nutella on my bread for breakfast but for kids and adults all over the world this hazelnut spread brings a happiness to their day. I mean, who doesn’t like chocolate? I prefer to enjoy Nutella other ways, such as in cookies. Buying the big jar of Nutella at the grocery store will probably cost you around $5.99 or $10.99 for a double pack. Don’t get confused the large jar of Nutella isn’t the only jar I’ve seen. I’ve seen probably the worlds tiniest jar of Nutella that was the size of a Tic Tac box at my friends. He is a Nutella fanatic. He’s also had a picture taken with a giant 5kg Nutella jar. Now that’s a jar of chocolate. Whether there was actual Nutella in the jar, that I don’t know. So, where is Nutella made exactly? That is a question I was hoping to find answers to. After some research I did find what I was looking for at the Nutella Canada website where they share the History of Nutella and lots of other fun facts about Nutella that any die-hard fan should know. NUTELLA® has been in Canada for over 40 years and over the last decade has sold over 30,000,000,000g of product. In 2008, over 1.76 million households in Canada enjoyed NUTELLA®. Since Easter is here I was in the mood for chocolate and if you know me than you know I pretty much can eat anything to do with chocolate, including Nutella on a spoon. My little Easter chocolate creation is these super easy Oatmeal Nutella Cookies. It really is simple to make these cookies but lets talk a bit about Nutella nutrition. If you are gluten-free you are in luck because Nutella is gluten-free. All the ingredients that go into a jar of Nutella are natural and contain no artificial colours or preservatives and it’s even certified Kosher. There are plenty of knock-off hazelnut spreads on the market trying to mimic Nutella but so far no one has really come close in my opinion to nail a Nutella match. Peanut butter chocolate spreads are also now literally spreading around the world although I’m not a huge fan of the stuff. I’ve used it before to make a peanut butter chocolate molasses cookie but that’s about it. The nutritional values go to calcium at 2% and Iron at 4%. When I created this Oatmeal Nutella cookie last week it was while I was in the middle of typing a blog post. I was craving something sweet and since we don’t stock sweets that much that meant if I wanted anything I would have had to make it. The weather was nice so I pulled out the jar of Nutella that hasn’t had any love for a long time in the cupboard and got to work. My sister-in-law brought it over as a gift for me when I was in hospital for day surgery as a small get well gift because she knows I love chocolate. I decided to make my Nutella cookies with oatmeal instead of full flour to add more nutrition to the cookie. Once the batter was finished I put the cookie mix into the refrigerator for 10 mins. When I took it out from the refrigerator I lined my silpat on to the baking tray and rolled some balls. I didn’t make tiny balls either because I wanted to make large sized cookies similar to what you would get at Tim Hortons. I baked the cookies at 350 degrees for about 10 minutes then I removed them from the oven and onto a cooling sheet. Once cooled I wasted no time jumping in and man oh man are they delicious. 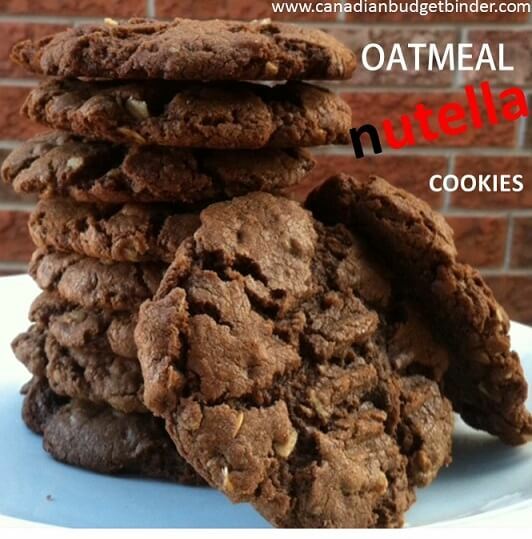 If you love Nutella you will enjoy these delicious Oatmeal Nutella cookies. You hardly taste the oatmeal but it adds just a bit more nutrition to the cookie instead of full flour in the mix. Bake for 10-12 minutes , remove and transfer to a cooling rack. If you want to add a nice fork mark to the cookies about 4 minutes in open the oven fast and set your fork on each cookie gently to leave the fork marks. Let cool and enjoy.. Even better the next day. In about 2 days all the Oatmeal Nutella cookies were gone although I found the flavour to get better on day 2. Between my wife and I we polished off one dozen which is what this recipe will yield. Have fun and enjoy Nutella all the time! My daughter really loves nutella! I should try this nutella cookies recipe. My wife would love this…she just had some Nutella on her vanilla ice cream tonight. Thanks for sharing the history of Nutella. I am one of those people who still enjoy Nutella. I kinda enjoy that recipe. This weekend I will be cooking oatmeal nutella cookies. Hah, I know chocolate on a spoon. What’s not to love? Try the cookies, they are awesome! Those do look good!! I’m not crazy about peanut butter or any of the nutty spreads but the chocolate part sounds yummy!! If I made these for company I would have to at least double the recipe. Even if they are big cookies they won’t last long enough to get cold around here!! In his heyday if you told hubby he could have ONE cookie he figured that meant one in each and and one in his mouth!! Ooh these look so good – I bet they’re great dipped into a cup of tea!